Saguaroland Bull. 26: 77 1972. Origin and Habitat: Northem Sonora between Moctezuma and Nacozari, Mexico. Mammillaria miegiana occupies the northernmost part of the Mammillaria standleyi distribution area. Altitude range: Altitude 500 - 1.300 metres above sea level. Habitat and ecology: Mammillaria miegiana grows on hills in a mountanious area together with Echinocereus polyacanthus, Echinocereus pectinatus, Coryphantha recurvata, Stenocereus thuberi and Agave parryi. Mammillaria lindsayi var. cobrensis Repp. Mammillaria sinforosensis subs. cobrensis (Repp.) Lizen & R.Schumach. Mammillaria sinforosensis f. rubriflora (Hils) Lizen & R.Schumach. Mammillaria xanthina (Britton & Rose) Boed. 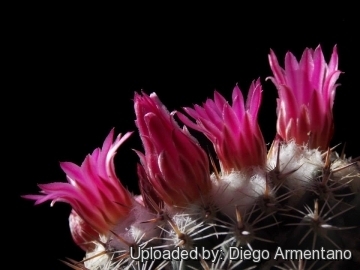 Description: Mammillaria miegiana, is a large, solitary species with subglobose stems, appearing white and producing large, dark reddish-pink flowers with scarlet midveins. 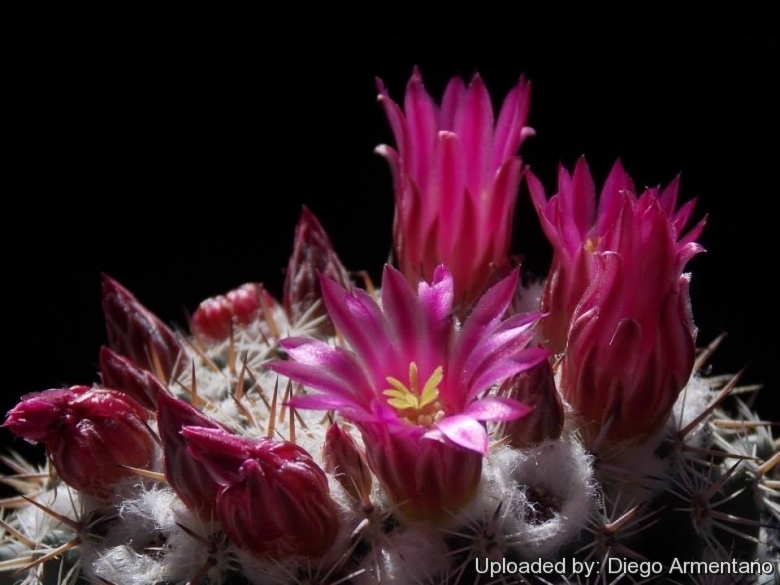 It is often included within (as a synonym of) the very variable Mammillaria standleyi, suggesting that there is not really a fundamental difference between the two. It is one of the most densely covered by spines. Derivation of specific name: This member of the Cactaceae family was given this name in honour of the US cacti collector Charles E. Mieg from Scottsdale. Mieg's mammillaria. Tubercles: Four-angled, axils woolly at first, later naked. Radial spines: 10-11, dirty white, greyish to somewhat dull pink, straight or slightly curved, 8-9 mm long. Central spines: 2, upper ascending, lower erect, brown, 7-8 mm long. Flowers: Reddish pink with scarlet midveins, to 20 mm long and 25 mm in diameter. Fruits: Club shaped, cherry red, to 25 mm long. Mammillaria floresii Fritz Schwarz: usually solitary. Central spines (2-)4, reddish 5-9 mm long. Radials few to 16, 4-8 mm long. Flowers purplish red to 12 mm long. Distribution: San Bernardo, Sonora. Mammillaria lindsayi R.T.Craig: forms clumps up to 1 m wide, has white axillary wool and bristles. Radial spines 10-14 white, centrals 2-4 , straight, brown to black, flowers greenish yellow. Distribution: Chihuahua and Sinaloa, Mexico. Mammillaria lindsayi var. cobrensis Repp. : is distinguishable from the type for the stem that is always solitary with a very woolly apex. The stem is dark green and it lacks of bristles in the woolly tubercles axil. Distribution: Barranca del Cobre, Chihuahua, Mexico. Mammillaria lindsayi var. rubriflora Hils: as the name implies it has reddish flower. 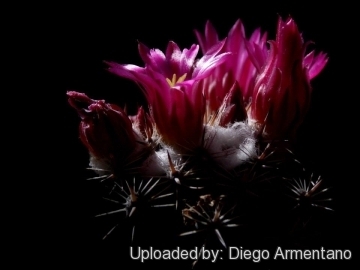 Mammillaria miegiana W.H.Earle: mostly solitary with stems, densely covered by spines appearing white and producing large, dark reddish-pink flowers with scarlet midveins. Distribution: Northem Sonora. Mammillaria standleyi (Britton & Rose) Orcutt: very variable, with white radial spine, brownish centrals and white wool between the tubercles. Flowers purplish up to 12 mm long. Distribution: Chihuahua, Sinaloa, and Sonora. 2) Orrell T. (custodian) (2016). ITIS Global: The Integrated Taxonomic Information System (version Sep 2015). In: Species 2000 & ITIS Catalogue of Life, 25th March 2016 (Roskov Y., Abucay L., Orrell T., Nicolson D., Kunze T., Flann C., Bailly N., Kirk P., Bourgoin T., DeWalt R.E., Decock W., De Wever A., eds). Digital resource at www.catalogueoflife.org/col. Species 2000: Naturalis, Leiden, the Netherlands. ISSN 2405-8858. 4) Urs Eggli, Leonard E. Newton “Etymological Dictionary of Succulent Plant Names.” Springer, Berlin/Heidelberg 2010, ISBN 978-3-642-05597-3, S. 154. 5) Saguaroland Bulletin. 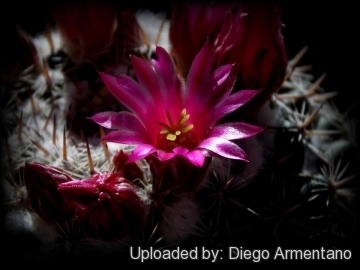 Desert Botanical Garden, 26:77 1972. Cultivation and Propagation: This plant is easy to cultivate but slow growing. Cultivate it in a well drained and mineral substratum. Water regularly, avoid the use of peat or other humus sources in the potting mixture. It need full sun, so it keep a compact and flat shape. It does not tolerate intense cold, but tolerates some cold if kept dry. Frequent transplantations of the young plants protect the lower part of the stem from the lignification, to which the plant has a tendency. Reproduction: It is propagated by seed. Sometimes old plants forms large clumps with several joints - but the removal of one of these joints may prove fatal to the plant.